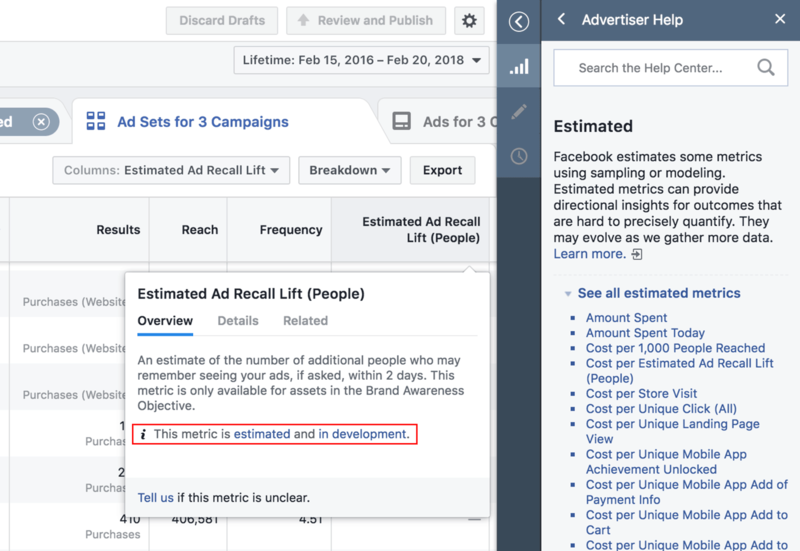 Facebook is making its ad metrics clearer by introducing new labels that show how they are calculated. Labels can also be displayed using the customize column selector for ads running on Facebook, Instagram, and Audience Network. Reach, for example, is calculated using sampling methods. Not just on Facebook, however, as reach for TV and other digital ads are estimations also. What Are In Development Metrics? Metrics marked as being in development are either new or still in testing. Facebook has to test its metrics before launching new ad products. Therefore, the way an ‘in development’ metric is calculated may change over time. Then there will be some metrics that end up being both ‘estimated’ and ‘in development,’ as shown in the screenshot below. As an example, Facebook will be removing the social reach metric because it is not different enough from the regular reach metric. Facebook did not provide a complete list of metrics that will be removed, but I expect there will be more details as July approaches.